After an eight-hour deluge and cracks of thunder and streams of lightening, Jill and I awoke to the captivating fragrant of septic. Our inviting marble designed shower flooded and the toilet would not flush. With visions of a prior Mexican adventure fresh in our minds, we were delighted maintenance followed by housekeeping made an appearance and restored our five-star accommodations to its original glory. The rains in Bali are tropical and mostly short lived but what accompanies the rains is humidity and for me it’s deadly. It’s like the weather gods have sucked out every last bit of air for me to breathe. When we step outside, it takes a few minutes for bodies and cameras to adjust. Even my camera sheds layers of sweat (condensation from the cold to hot) before it’s ready to focus. 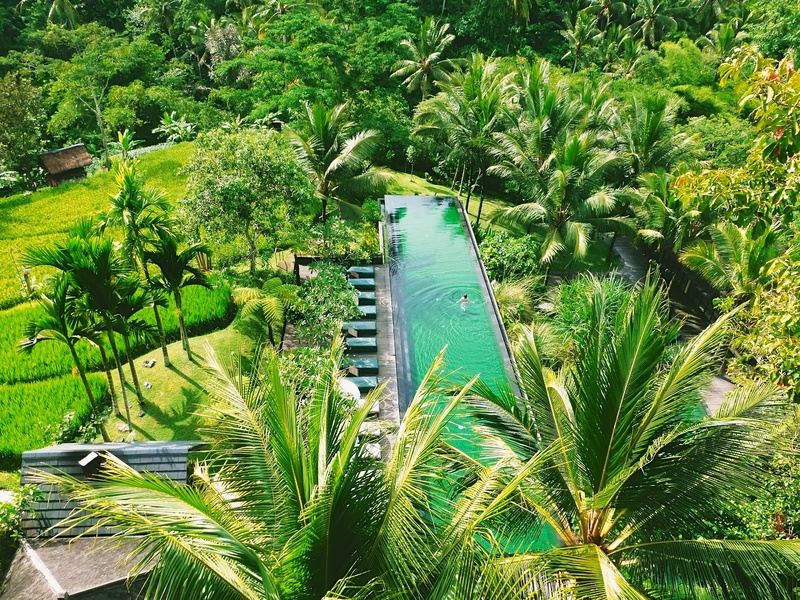 We said good-bye to the lovely smiling and bowing staff at the Oberoi and made our way to the village of Ubud now well known because of a little book and a little movie called Eat Pray Love. While I of course love fairytales, Jill actually selected Ubud because it’s a complete contrast to Seminyak. It’s located at the foot of a mountain range amid a tropical rain forest and gardens and rice farms every direction we head. As many of you may know, I am a firm believer in acupuncture and Chinese medicine. It seems when modern medicine fails it’s worth trying something – anything new. On the way to Ubud, we stopped to see a well-respected medicine man named Cok, the “Prince of Nigeri.” Cok is an 80-year-old spiritual healer who I trusted with curing ALL of my ailments. What ails me you say? Where to start? Our new friend John the manger at the Oberoi arranged for us to visit his medicine man in Ubud. Everyone in Bali has a favorite or “go to guy” as I like to say. Since John is American and we liked him, we figured it was safe. I felt a bit of angst after I asked our driver if he had seen the “medicine doctor” and he misunderstood and informed me he just sold his motorbike–his only mode of transportation–to pay for his 14-year-old daughter’s kidney stone surgery. In a more disgusted than animated way, he detailed an unfortunate practice here in Bali where doctors require payment prior to surgery (this would be $500 USD) but often take the money and run. There is no guarantee that the doctor won’t abandon the patient and the government is corrupt so no one is held accountable. Here I was willing to pay $50 to have a stranger heal my supposed wounds and this gentleman is selling off his belongings to help his daughter. We traveled by car until we turned into an area tucked away from the main road. Hidden from view and surrounded by bushes we saw our Cok, our medicine man, healing a local villager. Cok conducted his healing perched on an open air, cement 10×10 slab with a thatched roof. A sisal rug covered the ground and three barking but harmless dogs roamed as protectors. Cok sat in a rocking chair and there were two tables in L shaped scattered with messy papers and a framed human body with lines and words in another language. As Jill and I patiently waited our turn, we observed a man from the Netherlands feverishly taking notes and Cok sitting in his chair smoking commenting to our driver that he has an expensive car (Corolla). Cok had yet to ascertain whether we were big money or big believers and couldn’t quite understand why this man was accompanying us. I went first. Sitting with my legs outstretched and my back to Cok, he pressed at certain points on my face, in my ears, on the crown of my head, and into my glands and neck. Some points were tender; others painful and the rest no bother. He quickly diagnosed the following: right sinus issue (true), lymphatic flow issues (maybe), intelligence (of course), worry, fear and doubt (possibly) a problem in my mind (likely) then he asked me to lay down on the sisal rug. He poked at my abdomen, and “barely” (his words not mine) touched pressure points on my left foot. The pain bordered on torture. As I winced and held back tears, Cok explained I was “sick” in these areas. Pressure points in our feet correspond to various parts of the body. As if I needed more confirmation, Cok reported that I suffer from a mind trauma, a broken heart and that lethal combination is wreaking havoc on my liver. He also said I have no life balance (possibly) and that he would assist me in creating more harmony. The student from the Netherlands stood on my feet, waved his hands like some belly dancing moves and essentially flushed out the bad from my body. When Cok tested the previously painful spots, I didn’t feel a thing. I was cured. A glutton for punishment, I pushed my luck and asked Cok if he could fix my foot, the other reason for my visit. He studied my foot for a moment and then went to work digging into points that were so excruciating I cried out in pain and this time tears of anguish followed. Cok then took my foot and pounded it on the ground several times. Let’s face it. I’ve already spent an exorbitant amount of money at the best doctors in the country what do I have to lose except my ability to walk? Watching me suffer, Jill was brought to tears. She said listening to my very real cries of pain were overwhelming. Since my mom will be reading this, don’t worry I can walk. The sensations in my foot are different than I expected. It doesn’t feel any better or worse but I am hopeful. If I had let a modern doctor to that to me, I would probably have needed a new foot. I wanted to trust this man. I needed to trust him and in a very mythological sense or a spiritual sense I needed to believe. Did the medicine man/healer tell me anything I didn’t know? I’m 38 years old (2 more hours until my birthday) and I can honestly say probably not much. I don’t like to admit it but I am very self aware but it’s fun to travel to Bali and have a healer take a go at figuring me out too. It seems we are all looking for the secret to success, the fountain of youth, the magical cure, the happily ever after story. It’s faith.